I arrived in Colombia with no plans. Names of several towns resided in my mind, possible destinations to check out near Cartagena – Baranquilla, Minca, Santa Marta – too many for 10 days in the country. But I was open to any experience, as my knowledge of Colombia was limited. One of my first trips after returning from 14 continuous months of globetrotting, I was tempted to use this time to rekindle the pleasures of being “on the road.” However, I also wanted to take it slow and indulge in my experiences, and if traveling has taught me one thing about assimilation, it’s that it takes time. Naturally, figuring out how to spend my 10 days in Colombia would be interesting. But a few hours in Cartagena was all it took, and the other town names promptly disappeared from my memory. The beating heart of Barrio Getsemaní is Plaza De la Trinidad. 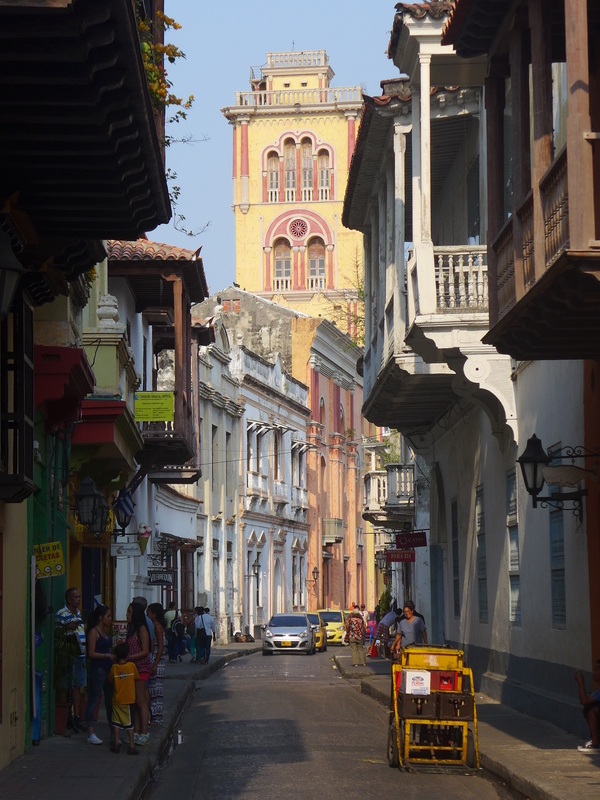 The cobblestone square, at the foot of a gorgeous, towering, yellow Iglesia, embodies the ebb and flow of this outlying neighborhood. 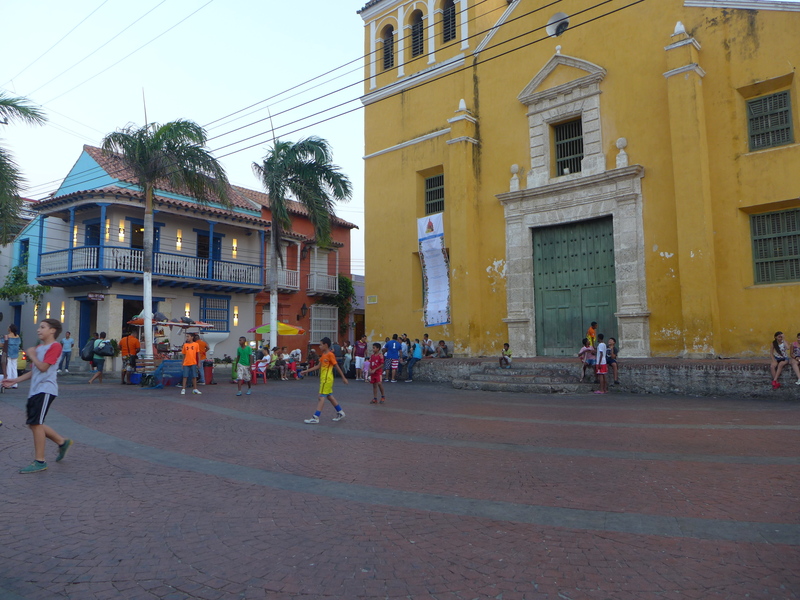 The following account is the story of that square, which, regardless of being merely one kilometer from the main gates of the walled city of Old Town Cartagena, presents a culture that is worlds apart. In its shadow, the church welcomes a constant Caribbean breeze. Residents take refuge in this enclave, escaping the heat that creeps in slowly during the early morning hours. Warm greetings of “Buenas!” echo through the narrow, colorful streets as locals match the slow pace of the central square. Palm trees slightly sway in the wind, and the city slowly awakens. 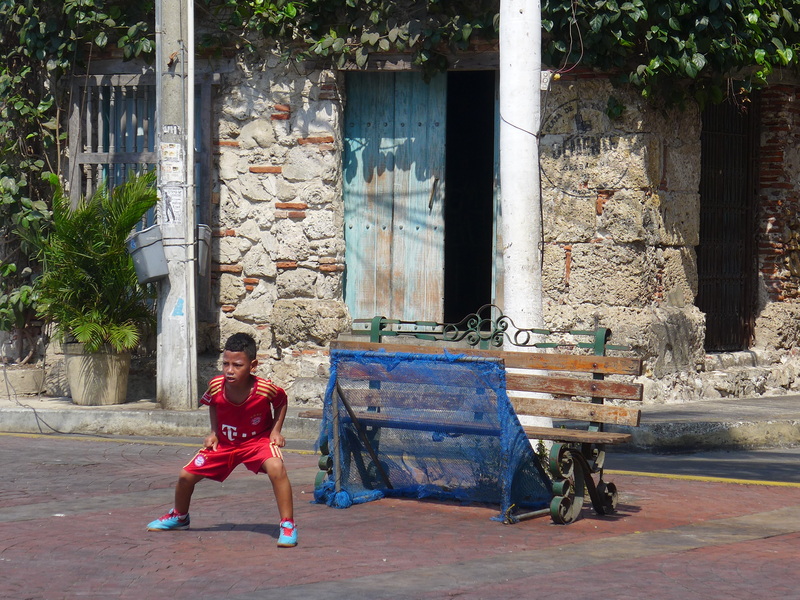 By noon, the colors of the square are accentuated by a sea of red and white, as barefoot kids in opposing jerseys have a friendly fútbol match. 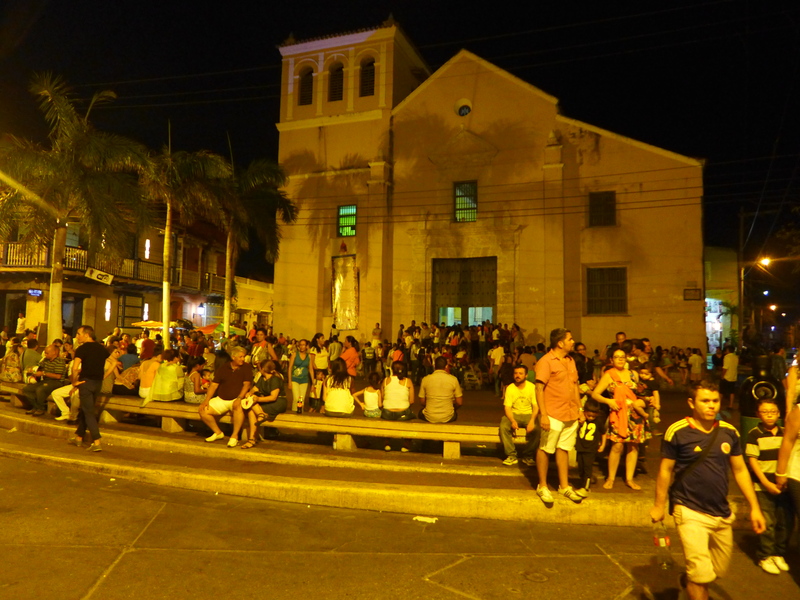 Members of the community and the occasional random spectator congregate on the church steps, rooting on the young players. Stray dogs and children occasionally dash through, yet the match continues uninterrupted. Every other day, the square simultaneously hosts either a wedding or a church procession, and everyone takes part. 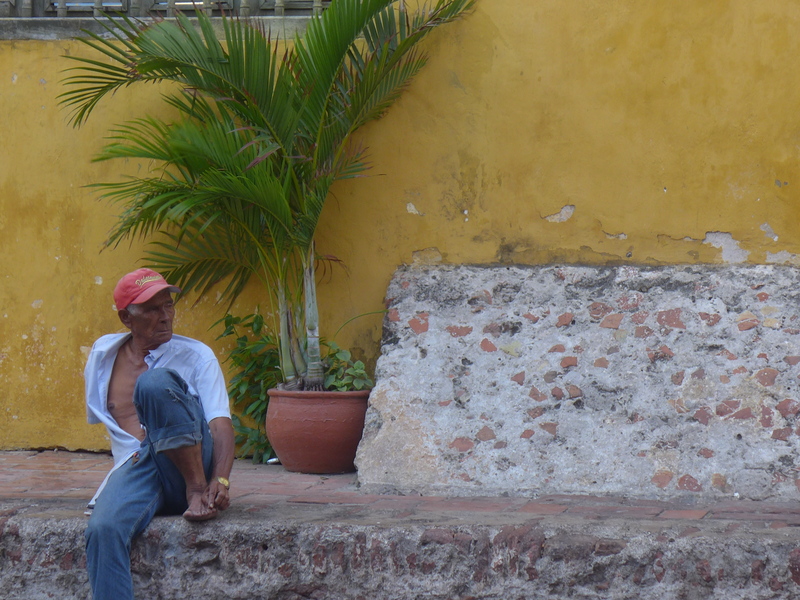 Old Colombian women gossip in front of the colorful stone walls of their colonial homes, while the empanada vendor on the corner catches up with friends. As the sun settles behind the surrounding rooftops, the drop in temperature brings with it a new scene. A lone speaker from the corner market blasts upbeat champeta tunes, food vendors populate the street, and locals file in for a bite and a beer before strolling over to the local salsa bars. The armed men in military uniform that patrol the square tell the story of this once dangerous neighborhood, the historical slave quarters of Cartagena, yet this image is effectively drowned by the neighborhood’s new identity, one that is defined by a strong sense of community and a unique charm. It is within the four square blocks that surround Plaza de la Trinidad that I spent my ten days. I never made it to the historic city walls or had a drink in Plaza de San Diego. Nor did I stroll down to the affluent beachside of Boca Grande, or soak in the tropical sun of Playa Blanca. 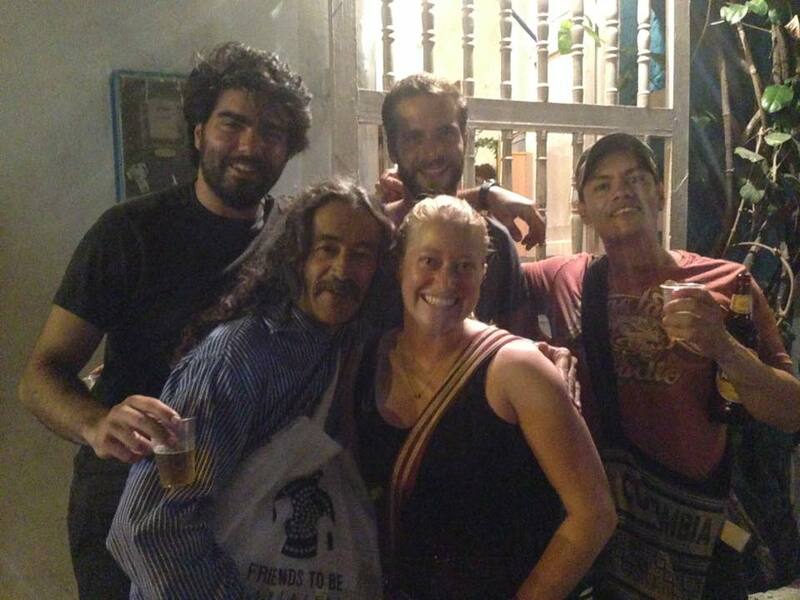 I was mesmerized by the energy and warmth of Getsemaní. Nothing felt more right than lounging in the shade of the church while chatting with familiar faces, becoming more comfortable with the Spanish exchanges with each passing day. I craved the taste of buttery arepas every morning, but only from the old lady near David’s Café del Mural, where I spent most of my late afternoons. 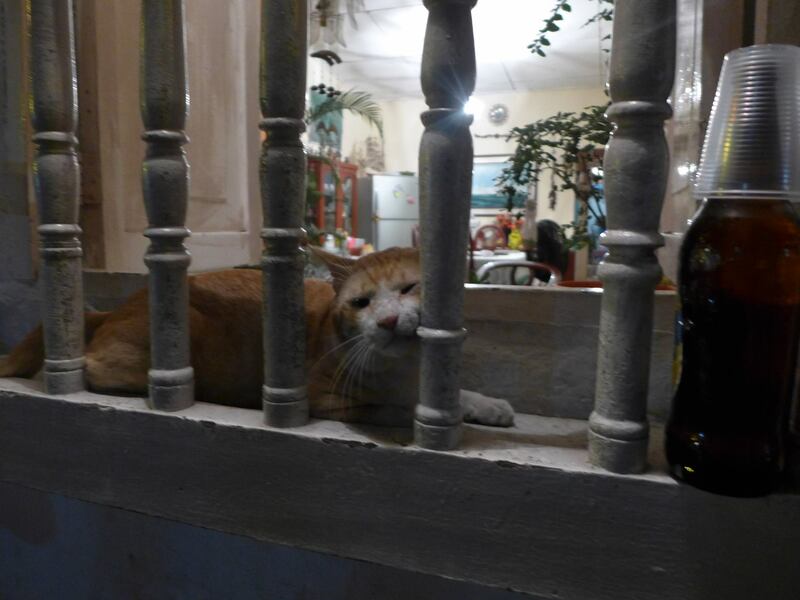 And evening plans were never discussed, as I would always find Ronald, Gabriel, Sara, Elizabeth, Salvador and the rest of the gang in front of Señor Rafa’s home, who lived next to the corner market and sold ice cold Aguila beer from his window for a fraction of the price. 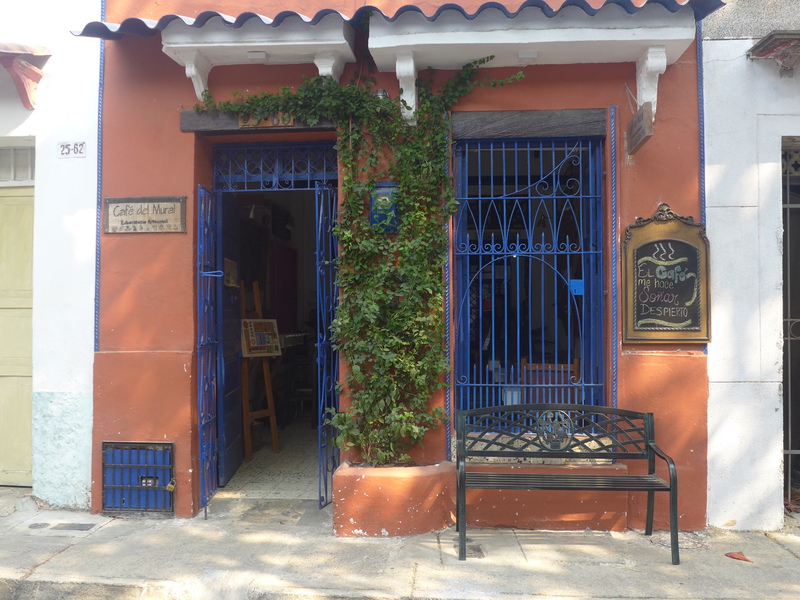 What influenced me the most during my visit to Cartagena was how easily I became a part of the city. 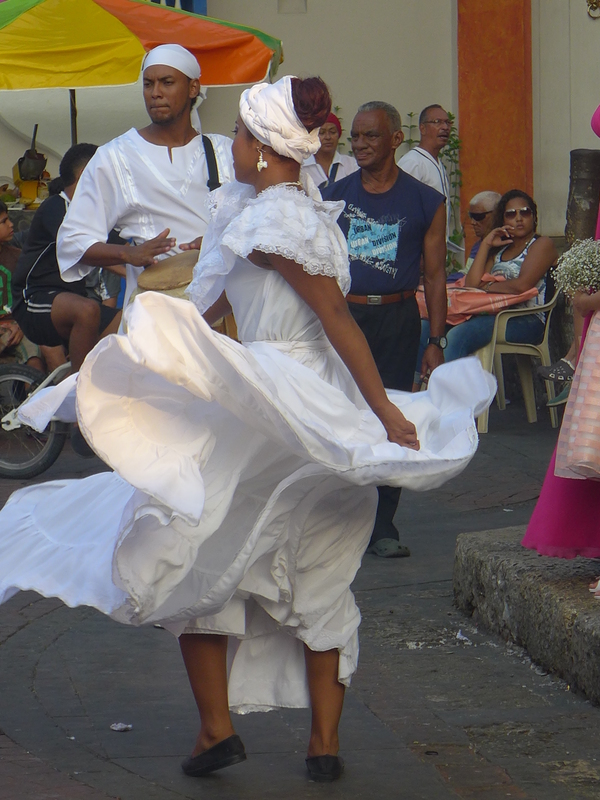 I comfortably assimilated to the pace of Getsemaní, and soon found myself in a routine and community that felt as natural as home. My newly formed relationships within the community brought me ever closer to not just that which is Colombian, but what I can comfortably say is the ubiquitous warmth of Latin culture, and have set the stage for many future trips to come. How about the guy that sold you the beer out of the window?…..
wasn’t any reason to go anywhere else.